The price is hot. Asus proves with the K53SK-SX021V that you don't have to spend more than 600 Euros for good performance. Alongside the metal palm rest, the brand new Radeon HD 7610M catches your eye. Can the 15-inch all-rounder stand against the tough competition? With its inconsistent naming politics, Asus is currently confusing not only customers and internet retailers, but also us reviewers. That's how we ended up ordering both the K53SK-SX021V and the X53SK-SX028V, which are almost exactly the same notebook. Compared with the SX028V, which costs about 50 Euros more, the model at hand is a bit more thinly equipped. Instead of six GB main memory, the SX021V has "only" four GB DDR3-RAM. The processor differs in the same way. While the first model puts forward a quick 2.4 to 3.0 GHz Core i5-2430M, the latter variant just has a 2.3 GHz Core i3-2350M. The rest of the components are pretty much identical. Since both devices perform similarly in the day to day, the cheaper model is actually good enough. In case you are wondering why we aren't covering the case, input devices and connectivity in this review - it's simple: apart from the new USB 3.0 port and the different case bottom, the notebook is basically corresponds to the X53E-SX082V, which we just examined a few months ago. Unsurprisingly, Asus uses the same panel as they did for the X53SK-SX028V (Chi Mei N156BGE-L21). A brightness of about 190 cd/m², a black value of 1.0 cd/m² and a contrast of about 190:1 are in the normal range for multimedia notebooks. The glossy surface ensures that the colors are acceptable, but outside the all-rounder doesn't cut a very good figure (there are strong reflections). Tip: Those who are looking for a good display should go for the HP ProBook 6560b-LG658EA or the Schenker XMG A501. The K53SK-SX021V encompasses a well-balanced mix of attractively priced mid-class components. A DVD burner, four GB DDR3-RAM and a 500 GB HDD will be enough for the average user, and so will a dual-core processor and a gaming-grade DirectX 11 graphics card. Numerous competitors contain only an entrance-level GPU on the level of the GeForce 410M. With the Core i3-2350M we're talking about a dual-core from Intel's successful Sandy Bridge generation. Because of the missing turbo boost technology, the CPU can't dynamically overclock (as opposed to the Core i5 and Core i7 models), under load it's constantly at 2.3 GHz. The hyper threading technology, which provides every real core with a virtual pendant (four threads), hasn't been dropped by Intel. In comparison with the Core i5-2430M built into the more expensive X53SK-SX028V, of course the CPU struggles a bit. Because of the lower clock speed, in single-core rendering of the Cinebench R10 the i3-2350M lags about 21% behind (3743 vs. 4752 points). In multi-core rendering, at 17% the lag isn't quite so bad (8220 vs. 9885 points). 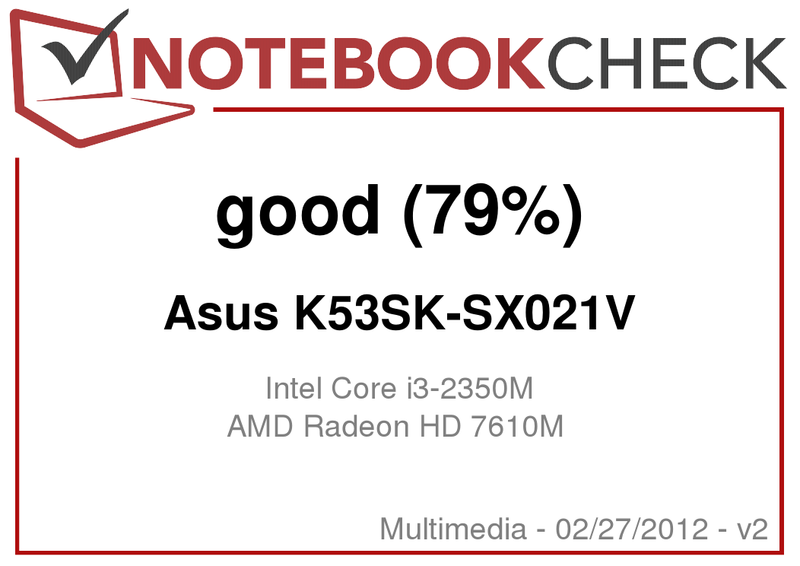 Like many other multimedia notebooks, the Asus K53SK-SX021V has two graphics cards slumbering under the hood. Depending on the demand, either the HD Graphics 3000 integrated in the processor or the dedicated Radeon HD 7610M takes on the task. But don't be misled by the label - strictly speaking the HD 7610M is not at all a new development. The chip is based on the old generation - even the manufacturing technique still comes to 40 nm. The graphics card is most comparable to the Radeon HD 6630M, which clocks minimally higher (485/800 rather than 450/800 MHz) and possesses 20% more shaders (480 rather than 400). Taking into consideration the thin storage interface (only 128 bit), the 2048 MB DDR3-VRAM seem a little over-dimensioned. Definite positives are the moderate power usage and the built-in video decoder. 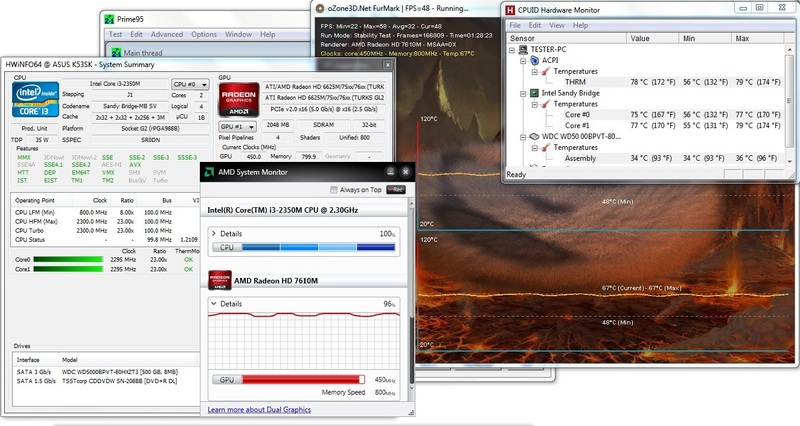 As expected, the Radeon HD 7610M can't quite reach the level of the HD 6630M. For example 3DMark 11: With a GPU score of 749 points, the graphics card makes itself comfortable about 15% behind its older sister (877 points @ Sony Vaio VPC-CB2S1E/B). Also furnished with a Radeon HD 7610M, the X53SK-SX028V received 744 points in the test. For a hard drive (like in the X53SK-SX028V), the Western Digital WD5000BPVT-80HXZT3 is put to the task (5400 rpm). With a data transfer rate of an average of 70 MB/s, the 500 GB HDD is in the mid-range. While lower priced notebooks were generally not good enough for gaming some years ago, with a 600 Euro device today you can even enjoy current titles. With the exception of extremely demanding games (ex. Battlefield 3), in the native 1366 x 768 pixels most mid or even high graphics options are possible. Those who can do without maximum details and active anti-aliasing should be pleased with the Radeon HD 7610M. Entry-level models like the GeForce GT 520M often compute noticeably slower. In short: With the Radeon HD 7610M Asus made a good choice; stronger graphics cards are seldom to be found in this price range. The level of noise generated here is completely fine. In idle mode you only hear the hard drive, and even during periods of higher demand the fans don't get uncomfortably loud. The case surfaces are neither especially warm nor extremely cool. About 30°C in idle mode and 33°C under load are respectable values. The hardware reaches into no critical regions, either (see the screenshot). Since most of the components are identical, the battery life is similar to the X53SK-SX028V. The 6-cell lithium-ion model (56 Wh) holds out between one and 4.5 hours, depending on usage, the energy saving profile and display brightness. Summa summarum we'd call the K53SK-SX021V a routine and relatively unspectacular multimedia notebook. Although the 15-incher targets customers with a nice pattern and a metal keyboard border, the case doesn't knock our socks off. Input devices, connectivity options and manufacturing are just as average as the speakers and battery life. Asus does deserve praise for the low power usage and the moderate emissions. A high temperature and noise level isn't to be feared, even under load. Thanks to the modern dual-core CPU and halfway potent mid-range GPU, the all-rounder offers very good performance. Normal every day tasks like Office, internet or film are mastered by the notebook with bravura, and even occasional gamers will be able to do what they enjoy. Meanwhile, it is unfortunate that the manufacturer integrates a low-grade display. Black value, viewing angle and contrast are all exceptionally weak, which is most noticeable with darker images at night (the competition is hardly any better). Since the notebook passes over the counter for just 600 Euros, you should still be able to close an eye here. An alternative with stronger performance would be the Lenovo IdeaPad Y570, which contains a faster GeForce GT 555M and is also sold for 600 Euros. Asus offers the notebook for a very fair price. An adequate display and more ports. How much power you can get for 600 Euros nowadays. Other price-performance sensations in the 15-inch format. There we have for example the Lenovo IdeaPad Y570 or the Packard Bell EasyNote TS13HR.